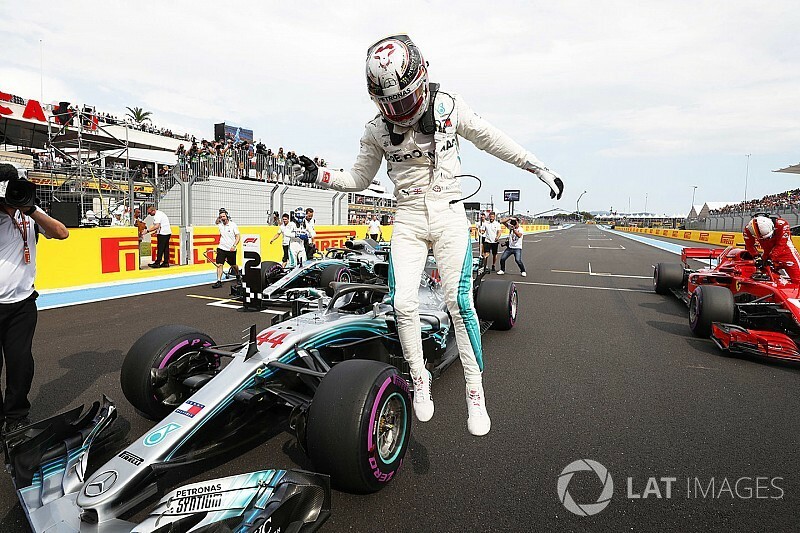 Lewis Hamilton beat Valtteri Bottas by 0.118s to lead a Mercedes one-two in qualifying for the French Grand Prix on Formula 1's return to Paul Ricard. Mercedes looked strong during practice, and had the advantage throughout a qualifying hour during which rain threatened and fell lightly but never seriously impacted conditions. Hamilton took control of the Q3 top 10 shootout by posting a 1m30.222s lap on ultrasofts on his first run, putting him a tenth ahead of Bottas and almost two tenths clear of Ferrari's Sebastian Vettel. That was before the session was stopped thanks to Haas driver Romain Grosjean crashing at Turn 4. When the session restarted, Vettel was unable to improve on his earlier lap of 1m30.400s, meaning it was a battle between the two Mercedes drivers. Max Verstappen and Daniel Ricciardo were fourth and fifth for Red Bull, with the former almost seven tenths off pole, but ahead of Kimi Raikkonen's Ferrari. Raikkonen posted his time of 1m31.057s before the red flag, but when he headed out to improve had an oversteer moment into Turn 4 and was unable to do it. Hamilton, Bottas, Ricciardo and Verstappen will all start the race using supersoft Pirellis, having used the slower tyres to set their Q2 times. Ferrari, by contrast, ran in Q2 with the ultrasofts that were favoured by everyone else throughout qualifying on both Vettel and Raikkonen's car. Carlos Sainz took best-of-the rest honours for Renault in seventh place, just over a second slower than Raikkonen. Sauber rookie star Charles Leclerc reached Q3 for the first time in his F1 career and beat Haas driver Kevin Magnussen to eighth place. Grosjean was classified 10th after failing to set a time during Q3 thanks to the shunt on his first flying lap. He spun at the exit of the Turn 3 left-hander after the rear stepped out and slid nose-first into the Turn 4 barrier, reporting he was unable to engage reverse to recover. Esteban Ocon was the fastest of those eliminated in Q2 amid some very light drizzle thanks to being bumped by Leclerc moments after jumping up into the top 10 with his final flier. Renault driver Nico Hulkenberg was also eliminated despite his late improvement, ending up just six hundredths off the top 10 despite what he described as "a very good lap". That put him ahead of the second Force India of Sergio Perez and Pierre Gasly's Toro Rosso. Marcus Ericsson was 15th for Sauber and reached Q2 despite having crashed during yesterday's free practice session. As a result, he missed Friday's second session and then was limited to just three laps this morning thanks to rain before qualifying. Fernando Alonso's late lap was only good enough for 16th, 0.027s slower than Hulkenberg and half-a-tenth ahead of the Toro Rosso of Brendon Hartley. Hartley will start at the back of the grid hanks to taking new engine components today, and complained that wind, traffic and some spots of rain late in Q1 compromised his run. Stoffel Vandoorne was 18th fastest in the second McLaren, ahead of Williams duo Sergey Sirotkin – who escaped action after an investigation for potentially impeding Hulkenberg - and Lance Stroll.